What made the experience of listening to The Garden of Letters the most enjoyable? The story of the main characters was told in separate time lines, as you follow the main character you find out what brings Elodie on her journey from her home in Verona to Portofino where she meets the one man she has to trust with her life. What other book might you compare The Garden of Letters to, and why? There is no book I could compare it too, as it really has a story of its own. This for me was a new look at the Second World War, I loved how Elodie's love of music was the main strength of the main story. I loved the whole book, mainly because of the narrator as she brought Italy to me as a listener I missed nothing of the main story. I loved how the author through her vivid and wonderful writing I was able to hear Elodie playing her cello as the descriptions were simply perfect. This is a story which truly brought the Second World War alive though this showed Italy through the war. The cruelty of the Nazis was evident but yet the bravery of the characters was so much more. This story went above my expectations. The narrator was absolutely wonderful, and my most memorable moment was when she failed the mission. The book was just ok for me. The story seemed to lull in places and the. capture me in others. I also think the ending was abrupt and odd. Would you try another book from Alyson Richman and/or Elizabeth Sastre and Alyson Richman ? Elizabeth Sastre is an excellent narrator. Would you be willing to try another book from Alyson Richman? Why or why not? Yeeeeeeaaaaaahhhh....I guess. I'd want to give her another chance. The story had potential, then sort of just fell apart at the end. This book started off well. It was interesting, good character development. Towards the end it just fell apart, I didn't like the ending at all. I don't know, it kind of just left me wanting more. One thing I hated the entire book was her overuse of descriptive descriptions (if that makes any sense). It left one feeling unrelatable to the characters sometimes, because things were often just not described in a realistic way. Like, "he could see her reflection in her eyes." While you technically can, you're not seeing your own expression in someone else's eyes. And, while the story should have only been spoken by the two main characters, she would jump to over to the person the main character was talking to and briefly describe the situation from their side of it, or explore how they were feeling, and then jump back to the main character. There was lots of eye rolling from me throughout the book, but it wasn't irritating enough for me stop listening. The narration was excellent, and really saved the story. Definitely, first the novel was beautiful, second, the narrators were awesome. The room of letters and how it's transformed in the end. What about Elizabeth Sastre and Alyson Richman ’s performance did you like? Both of them were so realistic, at times you could swear there was also a male narrator. I loved this tender work of heart! The author and narrator took me away to this time and place, and I loved every minute of it. 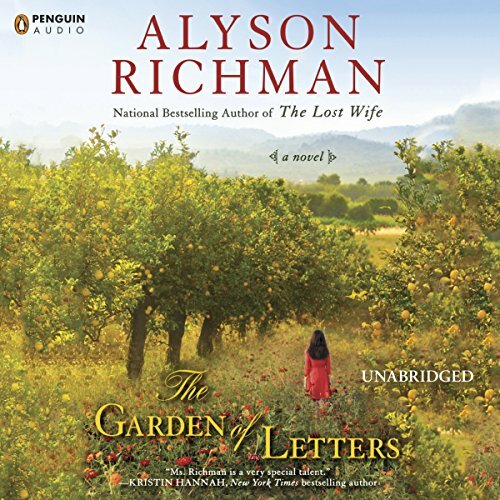 I have read or listened to all of Alyson Richman's books but she has certainly topped herself with this one. Her descriptions are breathtaking and make every word come alive. The way Alyson is able to entwine beautiful music, true history of one of the world's most despicable times, together with love stories is unbelievable. The writing together with Elizabeth Sastre's narration make this a book that you don't want to put down. I really enjoyed this book. The characters really captivated me. Would highly recommend to everyone. Love this author, and this book makes me love her more! wonderful story. This left me hungry to learn more about the Italian perspective to WWII and their involvement. The love story was beautiful. Plot beautiful. Love scenes droned on and on and took way too much time on the love than tying up loose ends. What was one of the most memorable moments of The Garden of Letters? The best memories are Husband's bond with his belated wife (extended family dissapeared after baby and mom dies...), african adopted child (what happened?) Viola and musical pieces were fantastic. Classic Book store. Chuck full of good stuff. stay in vienna was foggy and got lost for me. My favorite 'scene' is wrapping up the beginning scene and tying it into where it was in the book. (am I weird or what?). I wanted more resolution. This left me with a sense of wanting to know: where's mom? How did she 'bounce back' so quickly to fall in love with the doctor (count days on the calendar to drop true love off the list and move over to a doctor). I am glad the doctor never came off as a 'hero', but a servant of healing inside and out, that he was shrewd, but tender hearted. time to heal. Italian bookstore was fun! Ditch the long steamy scenes; they took extra time from the plot.